Finally, another real post! The “One Word Wednesday” posts are a nice fun diversion, but when they took over my blog it felt like a bit of a cop out. Hmm, did I say that out loud? 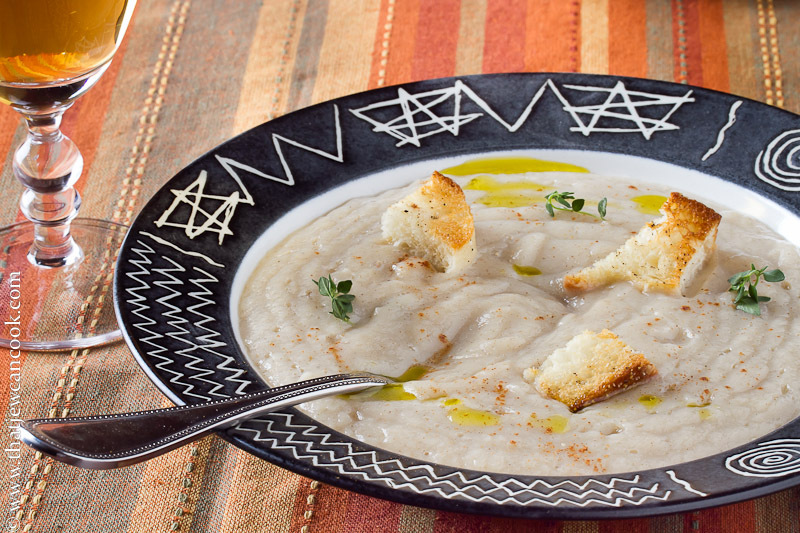 Fall is here, which means soup season has begun. Soup is always great to take away a bit of the chill and leverage some of fall’s great bounty. Squash, turkey, mushroom-barley, shcarole and bean (sic), and even the lowly cauliflower, you name the soup and we’re there bowl in hand. Nicole always says that fall food is the best all year and I wholeheartedly agree. No wonder she wanted our wedding to be in October; it’s fall, but doesn’t encroach on turkey day. We are both huge Thanksgivingophiles and I can smell the L-tryptophan already. When devising a cauliflower soup recipe, I wanted to meet a few criteria: it needed to be fast, healthy, and most importantly really tasty. The blender has saved the day where somehow a few hundred RPMs combined with razor sharp blades turned the knobby, stinky, white mushroom cloud looking cauliflower into a velvety smooth and rich soup, without the need for butter or cream. My love handles are grateful. The only downside I can come up with (and it’s a bit of a reach), is the smell of steaming cauliflower isn’t very pleasant. Certainly not as pleasant as say…fried bacon. Oh well, grab a clothespin for your nose, turn on the fans, and lets get started. 1 quart of chicken broth or water. I’ll let you use the canned/boxed stuff if you’ve got it since the cauliflower would overwhelm the subtlety of your home made liquid gold. 1/4 tsp. ground cinnamon. We use a closer to 1/2 tsp. as Nicole is hopelessly addicted to cinnamon. If she gets much worse we’ll get her checked in with Lindsey Lohan. 2 tsp lemon juice. I think it was 2 tsp, we just squeezed a bit in until it tasted good. Let everything cool down a bit, and add the cauliflower, dried spices, lemon juice, and the thyme leaves to a blender. Add enough of the liquid from the pot to allow the blender to liquify things. Blend hard until its nice and smooth, about 2 minutes or so. I have the super-duper “will it blend” beast, which can make a smoothie from rocks, so this mushy mess is no problem. I am sure your blender will be just fine too. Be really careful blending soup, if its too hot, or the blender too full you will create a cauliflower volcano. You know this, because Andy knows this. Hold the top down for dear life. I don’t encourage it, but if you really want you could add a splash of milk, or cream to make it richer, but its pretty rich without it. If you wound up adding too much liquid, add some bread to the blender and give it another whirl. Reheat the liquid if it has cooled down too much. I don’t like cold soup. I never understood vishyswah (I won’t attempt the real spelling here), and gazpacho? Its just watery salsa to me. Pretty it up with some accoutrements like croutons, a few extra thyme leaves, or a swirl of olive oil or cream to make it look like you spent more than 2 minutes preparing things. Drink a little white wine, you know you want to. I used apple wine in the pic, but I don’t think I should even classify that drek as wine. Enjoy, and happy fall. It’s great to be back! I think the swirl of truffle oil brings cauliflower soup up a few notches. Autumn just inspires us to prepare and eat soup. Soup is soul satisfying and yours looks and sounds pretty damn good. If I bring the wine, can I pull up a chair and join you and Nicole at the table for a bowl of this delightful soup? Hey Andy! Welcome back to writing! I missed your foodie posts (although I enjoyed the photos fo sho!) I totally understand and go through the same “dry” spell, in fact, just did a post on it this morning. I agree with Velva about the truffle oil and liked that you added the chiles to the soup! Yea uh! For the blender, I would like to suggest taking the inner piece out and using a tea towel over the opening. Much less dangerous, I did have a friend severely burn her face doing that! And I agree with you 100% on the cold soup comments, esp. the part about the gazpacho tasking like salsa!!! I love the chipotle pepper idea with the other herbs and seasonings. I have tried a couple of cauliflower soups and they always have cheese… I am not complaining, but this one sounds completely different and excellent. I think that truffle oil is an excellent idea – but probably not on this soup.. it might take away from the flavours there.. or even clash with them. But, I do love it on soups! I have a great porchini chestnut soup that it is heaven on top of. I cannot wait to try this one. I have everything but the cauliflower! Its funny you mentioned the truffle oil. My palate is very insensitive to truffles. When ever people are swooning over this fungal friend I can barely discern it. Nicole’s palate is sensitive to earthy tastes, and thinks truffles taste like dirt (expensive dirt mind you), so we just go for the fruitiness of plain olive oil (and is what you see in the pic).